Papua New Guinea is a country located in the Pacific Ocean. 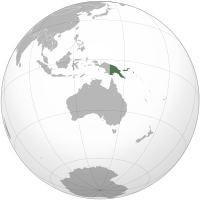 Papua New Guinea is a country in Oceania, and is near Indonesia and Melanesia. The country is located in the island of New Guinea. This page was last edited on 19 December 2014, at 21:07.